The arduous journey toward earning the rank of Eagle Scout is almost over for David Broske, who recently completed his Eagle Scout project. 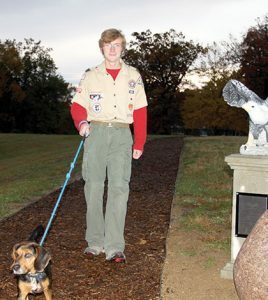 Broske, a member of Troop 320 in Columbia, led an effort to build a dog path at Helping Strays. He got the idea for the project after seeing how Helping Strays had been walking their dogs. “I like dogs, but I never had one,” the 16-year-old said. 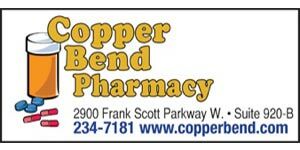 Broske’s project took extensive work to plan and execute. After receiving approval from the board of directors at Helping Strays on the location of the path, Broske and volunteers marked the place the path would be. They then used a Bobcat to level the whole area and installed a silt fence to keep particulates and debris out of the lake downhill from the path. To install that fence, workers dug a trench beside the path, put the fence in and refilled the trench. Next, they dug trenches on either side of the path and installed edging. They also created drainage systems on both sides. Finally, workers placed a weed mat over the whole thing, staked it in and covered the entire patch with mulch. All told, the project took about 710 man hours. It also took around $4,700 to complete, which Broske raised by asking businesses to donate and getting donations from friends, family and the community, sometimes through a link Helping Strays posted on its website. Broske’s brother, Paul, also did his Eagle Scout project at the animal shelter. He erected a 30-foot flag pole and landscaped the base. With his project completed, Broske said he plans to finish the paperwork and go before the Eagle Scout board of review in mid-December. Once that step is done, he will achieve the rank. Broske said he could not have come this far without help. Eagle Scout is the highest rank in the Boy Scouts of America. Only about 4 percent of scouts earn it.